The plastic bags people are most familiar with are generally made from polyethylene. This consists of long chains of ethylene monomers which are derived from natural gas and petroleum. The polyethylene used for plastic bags can be low density, mid density or high density and further additives can be used to add tints, etc. First of all pellets of polyethylene plastic resin are blended with specific additives. The additives will transform the resin’s qualities (for example strength, stretchiness, tear resistance, slipperiness, UV protection, etc to name just a few) in order to make them suitable for the specific application they’ll be used for. Coloured pellets can also be added in varying blends to create coloured film in a huge range of colours and with differing degrees of opacity or transparency. During this process small plastic pellets called resin are fed into extruders and melted down until they are molten and pliable. They are subsequently extruded (forced/pressed) through a circular die gap by screw drives to form a continuous tube of plastic. Air is introduced to form a ‘bubble’ which inflates and stretches the plastic to the required size and wall thickness. This continuous bubble/tube rises up and cools, after which it will be flattened out and wound onto a roll. Following extrusion the rolls of film can be taken to be printed onto (this isn’t always required). Different types of presses are capable of printing with varying complexity, from simple one or two colour printing on a roll to printing in a wider variety of colours and finishes, including matte, gloss or metallic. 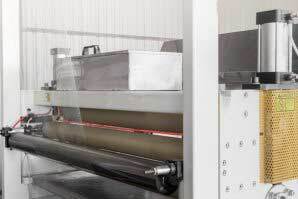 In order to convert the rolls of film into plastic bags, they are fed through a machine that can either convert them into single bags, bags on rolls with perforations or bags on wire wickets. First the machine draws the material out to the correct length, then repetitive bottom or side seal converting is done by the machine to create separate bags from the rolls of film. There are a wide range of different options then available in a production run, from creating holes, vents, slits or perforations to handle punching, wicketting, header sealing and zip-locking. Abbey Polythene uses low or mid density polythene in virgin food grade or recycled material (regran), which makes the bags easy to recycle. We also supply BRC approved food grade polythene and degradable polythene and some products are now available in a blended film that is stronger and thinner than low density polythene. All of Abbey Polythene’s products are either completely recyclable or biodegradable, so they produce the least possible waste, and all the scrap is recycled into polythene granules to be blown into usable film again. We can manufacture specialist polythene products using additives to create for example anti-static bags and sheeting, scented bags, tubing and sheeting in a range of fragrances and fire retardant bags and covers for extra safety. We can also add punched holes or micro-perforations if necessary. Take a look at our product pages or give us a call to discuss your specific requirements.